An excellent solutions for severely damaged teeth, dental crowns can repair and strengthen your pre-existing tooth. 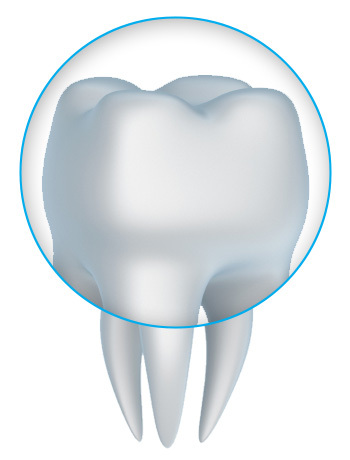 Gently placed over the original structure, dental crowns are often referred to as “teeth caps.” These crowns are normally reserved for teeth that have extensive damage in lieu of using traditional fillings. With a variety of dental crowns to choose from, porcelain crowns have become very popular due to their translucent quality. If a porcelain crown is recommended at your first consult with South San Francisco dentist Dr. Hovden, the full restoration process usually takes about 2-3 visits. After initial preparation, Dr. Hovden will take dental impressions in Daly City that are then sent to laboratory professionals who will create a crown specifically crafted to your specifications. During this time you will have a temporary crown to wear. A brief animation depicting the preparation for and application of a dental crown. Aesthetics: Because your dental crowns are made especially to match your existing teeth, there are obvious additional benefits other than repair, including beautification and symmetry. Timeliness: Other more invasive dental procedures could take months to complete. However, the process of applying crowns normally takes only 2-3 office visits. Durability: As long as proper dental care is maintained, dental crowns will often last for several years. Restoration: Now you can regain your beautiful smile and stop being embarrassed by cracked or damaged teeth. Dental crowns are a reliable way to reinvigorate your smile and ensure future oral health. Prevention: Because caps are placed over the natural tooth, they can prevent further damage caused by bacteria. Support: Crowns will give your damaged teeth the support they need and make you able to enjoy the foods you love. Contact us today in Daly City to discuss the benefits of dental crowns and how they can greatly improve your oral health! Dr. Hovden and his staff are happy to help the residents of South San Francisco and San Mateo County!